A renewable energy specialist from the Department for International Trade (DIT), and Siemens Gamesa’s UK chief both claimed competition would not be hindered by the UK’s impending exit from the European Union. 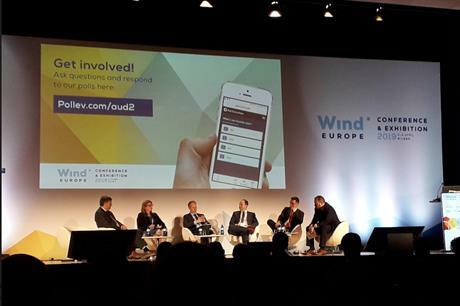 The pair were speaking on a panel about Brexit at the WindEurope 2019 conference in Bilbao, Spain (2-4 April). "We can’t comment on who is running and riding in the auction, but the expectation is way in excess of what is offered," said Karl John of the UK government’s international trade department. Estimates place the CfD budget as supporting between 1GW and 2GW a year. Clark MacFarlane, UK managing director of Siemens Gamesa, added the manufacturer had been in discussions with offshore wind developers and potential bidders for £60 million (€70 million) of top-up support provisionally available under the UK’s contracts for difference (CfD) scheme. "They are completely focused on the auction and getting on with the supply chain plan and the business case. "I don’t hear anyone say they are not going to bid," he said. The UK is due to hold its next CfD tender at the end of May — just over a month after the latest proposed Brexit date of 12 April. Currently, it is unclear what the UK’s future relationship with the EU will look like in terms of tariffs, movement of people, goods and services, or cross-border energy trading. MacFarlane and ScottishPower Renewables’ director of policy and regulation, Hazel Gulliver, told the panel their main concerns regarding Brexit were cost, customs and movement of labour. Gulliver added ScottishPower’s parent company, Iberdrola, had set up working groups to look at how it might mitigate these concerns and work around these challenges. For example, it had been stockpiling components in the first quarter of 2019 and ensuring it was aware of any possible documentation required for overseas workers, she said. Siemens Gamesa, too, has been preparing for Brexit by ensuring it had sufficient components in the UK ahead of schedule, MacFarlane said. He added that the projected 2.7% tariff on most wind power components under World Trade Organisation terms meant post-Brexit offshore wind development was "not a cost issue", while movement of people was "the biggest unknown". However, there remain unanswered questions regarding health insurance and visas, he said. Meanwhile, Mark Evans, head of UK business development at onshore wind developer ERG, claimed Brexit had been a distraction, diverting policy efforts away from encouraging other renewables. "The government has struggled to have the political capacity to deal with anything other than Brexit," he said. Evans pointed out that the old feed-in tariff scheme for small-scale renewables had recently expired, and the replacement support arrangement was inadequate. Meanwhile, onshore wind is still barred from competing in UK tenders, there is no support scheme for the technology, and no future prospects for it besides subsidy-free development. Brexit has also hindered offshore wind development in the UK, too, with political energy being diverted toward the UK’s exit from the European Union, the panel argued. MacFarlane claimed Brexit had delayed the offshore wind sector deal — a bespoke arrangement between government and industry announced last month to help boost offshore capacity to 30GW by 2030. "We were hoping to have the (offshore wind) sector deal complete by the end of 2017, but because of the political process of Brexit, we’ve had delayed meetings and discussions, which has meant business and policy development has been left behind. "That delay was definitely something we could have done without," he added.